When animator Bill Plympton was growing up, he aspired to be a cartoonist for Disney. If they’d given him a job, he would have had to tone down his twisted sensibilities, and the animation world would be poorer for it. Since much of Plympton’s colored-pencil animation isn’t seen outside of film festivals, Bill Plympton’s Dog Days will be a treat for his fans, and a good introduction to his work for those who have never heard of him. It has seven short films made from 2004-2008, music videos, segments from television specials, documentaries, as well as some interesting bonus features. The dog in the title is the protagonist of three of the shorts, Guard Dog, Guide Dog and Hot Dog. He’s pudgy and yellow, and inexplicably, has a belly button. His body vaguely resembles a bulldog, while his attitude is that of a smaller dog. He wants very badly to please humans, but he’s much more enthusiastic than competent. Plympton’s best work toys with audience expectations. The dog is an appealing character who deserves to succeed, but things never work out the way we or he hope. Another example is Spiral, which starts out as abstract animation. Just when viewers might start feeling bored, the story takes a surprising turn. These wouldn’t be Plymptoons without death and destruction. On one commentary track, Plympton says that he loves taking innocuous things — a squirrel, a pillow, a sweet little girl jumping rope — and making them deadly. Even Santa Claus can’t escape the Plympton treatment — turns out he was a facist. The rest of the films on the DVD are paid work. The best are three music videos. Weird Al Yankovic’s Don’t Download This Song is particularly suited to Plympton’s art.12 Tiny Christmas Tales, made for a Cartoon Network Christmas special, puts a weird spin on holiday stories. There are also segments of longer films. One segment illustrates a History Channel documentary on Shay’s Rebellion and looks quite different from his usual work. The most interesting bonus feature is an episode of “Art or Something Like It,” a show on a New York City cable channel. 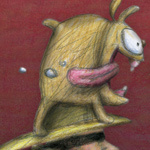 The 22-minute segment features an interview of Plympton illustrated with clips of his work. It’s a good overview of his career and Plympton makes a good subject. When he was finally offered that dream job with Disney in the early ’90s, he was able to turn them down. The shorts have commentary by Plympton. He talks about where he gets his ideas, his influences and how he works on the cartoons. He never runs out of things to say and seldom repeats himself. In Shuteye Hotel, he used computer-generated images for the first and only time. The process was so expensive and time-consuming, that he was happy to go back to just hand-drawing everything. Picture and sound are very good. This is the best way to see his films outside of festivals. The highlights of the DVD are the seven short films and the music videos. Start with those, and save the rest of the films and the bonus features for a second viewing.